FEAR FACTORY - TRANSGRESSION (CD) | Online Shop | Wizard LTD.
Transgression is the sixth studio album by American industrial metal band Fear Factory. It was released on August 22, 2005 through Calvin Records. Guest appearances include Billy Gould, the bassist of Faith No More, and Lamb of God guitarist, Mark Morton who co-wrote the song "New Promise". It is the last album to feature original drummer Raymond Herrera and bassist/guitarist Christian Olde Wolbers. 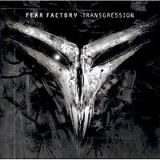 Transgression was the first CD Fear Factory recorded since Soul of a New Machine without Rhys Fulber's input. All Lyrics by Burton C. Bell, except where noted.